Seaport Ice opens November 28, and, yes, Virginia, there will be a tree. 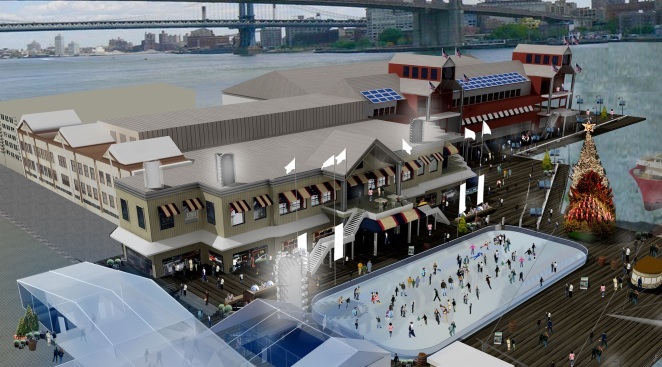 Get out the silver skates, Hans Brinker, because the South Street Seaport unveils it's snazzy new 8,000 square foot ice rink next week. The rink, Seaport Ice, will open at Pier 17 the day after Thanksgiving. It'll be the only place to skate in lower Manhattan, and if going around in circles in the freezing cold while overweight tourists topple into you is your thing, you should be really happy. With space for 325 skaters and lower prices, it might be slightly less annoying than Rock Center, and will offer better views. But just you wait, there's also a big tree. The lighting of the Seaport tree has been a tradition for 25 years, and skating will now provide the festive backdrop for the tree, which will be lit the day the rink opens replete with Santa visit and The Big Apple Chorus. Sure there are other trees in the city with other St. Nicks, but SSS claims theirs is the best calling him, "New York City’s most acclaimed Santa." Yeah, but can he skate?